Sandals have 15 resorts dotted across six different Caribbean islands, and while there are many similarities - including the adults’ only policy, incredible Luxury Included® restaurants, luxurious accommodation and unlimited land and water sports - there are also some exciting differences. Resorts with private islands, water villas, golf courses and fire pits for nightcaps under the stars are just a few of them. Whichever Sandals resort you choose it’s sure to be full of white sandy beaches, sunshine and romance, so read on to plan your Luxury Included® Caribbean escape. Antigua has 365 beaches, one for every day of the year. Sparkling shorelines and warm trade winds make this Caribbean island found in the West Indies a romantic escape for two. Sunbathe and snorkel in the crystal clear waters, find out about Antigua’s heritage on a visit to Nelson’s Dockyard, and watch the sunset over English Harbour from Shirley Heights. 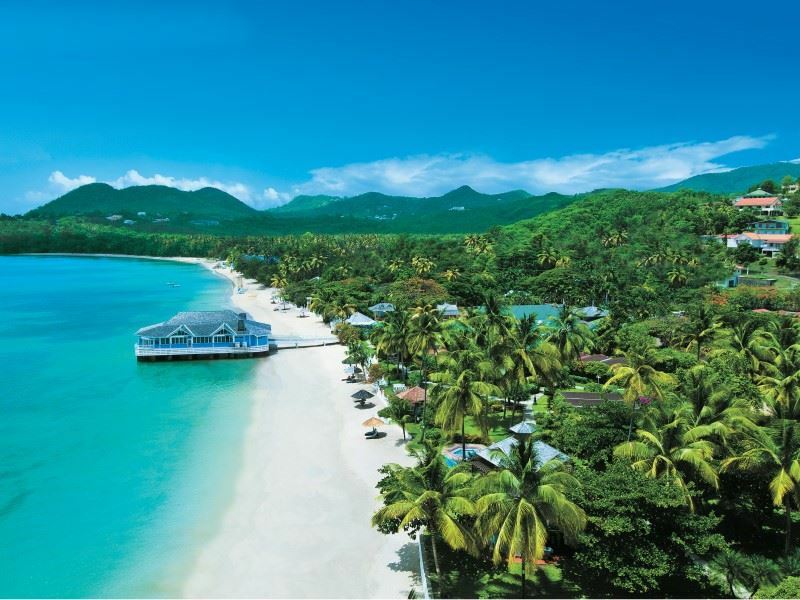 Sandals Grande Antigua Resort and Spa boasts a fantastic location on Dickenson Bay, Antigua’s longest stretch of shoreline. Calm, turquoise waters and beachfront accommodation await here. With only a fifteen minutes’ drive from the airport, it won't be long until you're relaxing in a villa or Rondoval with your own private pool sanctuary, and a personal butler on hand ready to tend to all your needs. If you fancy leaving your beautiful sanctuary there are six pools to relax by, two laidback swim up bars and eleven great restaurants to choose from. Just steps from the beach there are plenty of water sports to keep you busy, from Stand Up Paddle Boarding to sailing - or, if relaxation is your thing, Red Lane® Spa is the place to head to for pampering and indulgence. The Bahamas are a tropical paradise of 700 islands, cays and islets located just off of the coast of Florida. The capital city of Nassau is a cosmopolitan escape and there are hundreds of uninhabited neighbouring islands and stunning deserted beaches to be discovered. Bonefishing is a popular sport in the Bahamas as is diving and snorkelling amongst the colourful coral reefs. To spot the native wildlife Inagua National Park is home to the largest colony of West Indian Flamingos in the world. A must see are the swimming pigs who live on the tropical island of Big Major Cay in the Exumas, which is certainly something you don’t get to see every day. Sandals Emerald Bay Golf Tennis and Spa Resort is found in the Exumas, a tranquil island paradise which can be reached on a 40-minute flight from Nassau. You will feel like you are in your own secluded retreat in a beachfront villa with Butler Service. Pristine white sand and sparkling turquoise waters await on the mile long beach, which is part of the resort. A private beach cabana adds a heavenly touch of indulgence while the lavish pool covers half an acre and is just right for taking a refreshing dip. For the sports enthusiast the 18-hole Golf Course provides the perfect partnership for those seeking not just relaxation but some action too. Set right next to the ocean, this popular championship course has a stunning backdrop, so you can catch some rays and listen to the crashing waves at the same time as enjoying a round of golf. Sandals Royal Bahamian Spa Resort comes with its own private island, Sandals Cay. Relax on the mainland at the resort on Cable Beach in Nassau and have a romantic dinner for two on a pier over the ocean at Gordon’s. 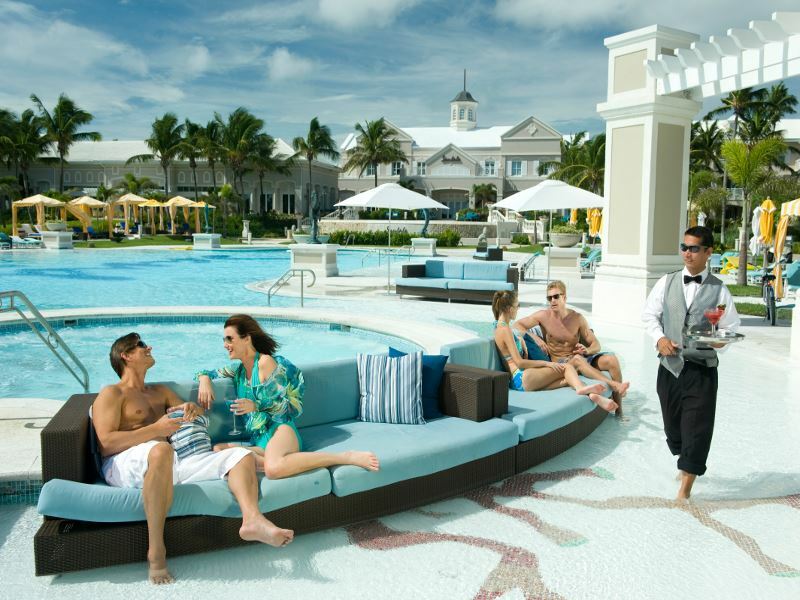 Sail to Sandals Cay for snorkelling, drink cocktails at the swim up bar or enjoy a Beach Club party under the stars. If you like a combination of relaxing with a cocktail on a private island shoreline and a lively nightlife then this is the perfect Caribbean escape. Barbados is a popular getaway amongst the rich and famous and it’s not hard to see why thanks to the dreamy palm lined beaches perfect for sunbathing. For water sports enthusiasts there’s plenty to do including surfing, snorkelling and stand up paddling boarding. Learn about the history and culture of the island with a visit to Bridgetown, the islands capital, tour a rum distillery or spend a day at the races. Topped off with world class dining and an island with a lively nightlife, Barbados has it all. 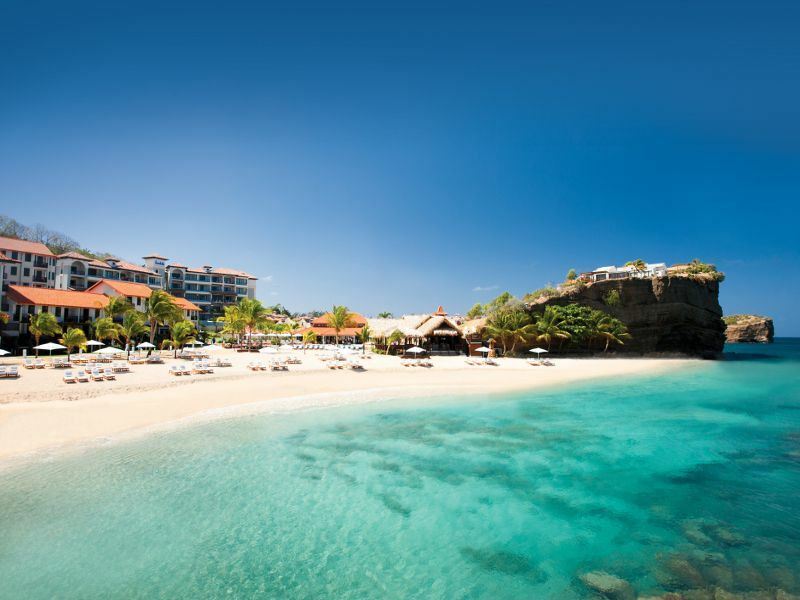 In a fantastic location Sandals Barbados has the best of both worlds, ideally situated right near St. Lawrence Gap there are plenty of spots for dining, drinking and partying outside the resort. If peace and tranquilly are more your style then take advantage of your very own swim up suite with direct access to the Crystal Lagoon Pool and private terrace for in room dinning directly. For a view of the beach and a touch of romance choose accommodation at the Beachfront Village complete with a Tranquillity Soaking Tub for two. Relax on Dove beach, take a yoga class, hit the fitness centre or have a game of beach volleyball. You can choose to do as much or as little as you like under the Caribbean sun. Known as the ‘Island of Spice’ due to the abundance of nutmeg plantations found on the island, Grenada has a fantastic mix of relaxation and adventure. You can lie back on a white sand beach and explore the lush mountainous interior of the island on foot, hike to magnificent waterfalls, dive amongst coral reefs and shipwrecks, or visit a spice estate on this beautiful island. 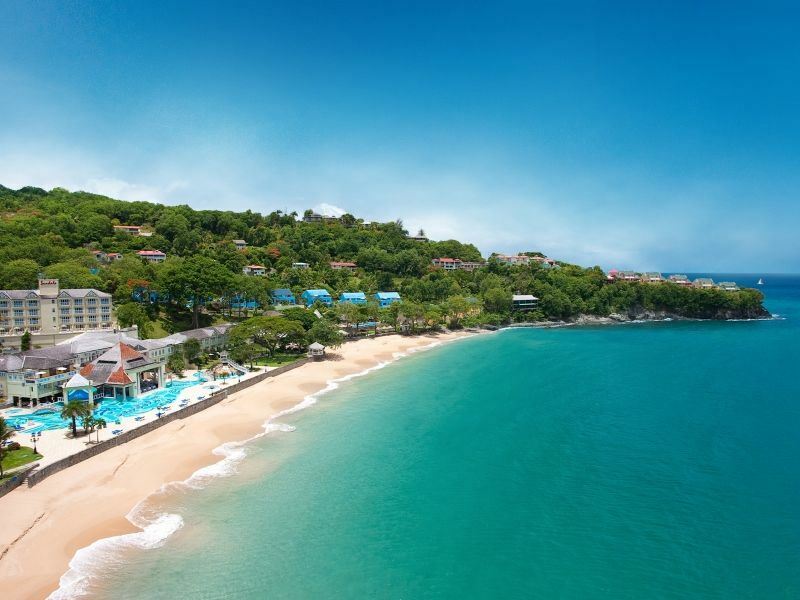 On Pink Gin Beach in the south west of Grenada sits Sandals’ latest creation, Sandals LaSource Grenada Resort & Spa, a chic and sophisticated Caribbean escape. For a really indulgent break for two choose a Sky Pool Butler Suite, where you can unwind with jaw dropping views of the shoreline from your own sky-high infinity pool. Workout with a personal trainer or to really feel the burn try out the Caribbean Beach Shred. For a slower paced day relax at the spa and indulge in a couples massage, rounding off the day with a cocktail as the sunsets, and a candlelit dinner on the beach. The home of Bob Marley and all things reggae, Jamaica is a beautiful Caribbean island reached in around 9 hours from London. Blissful beaches and a lush green interior make it perfect for couples looking for time on the beach as well as adventure. Climb up to the top of Dunn's River Falls near Ochio Rios and take a refreshing dip in the water, visit Nine Mile - Bob Marley’s birthplace, hike in the Blue Mountains, ride a horse along a beautiful beach and go on 4x4 off road adventure. 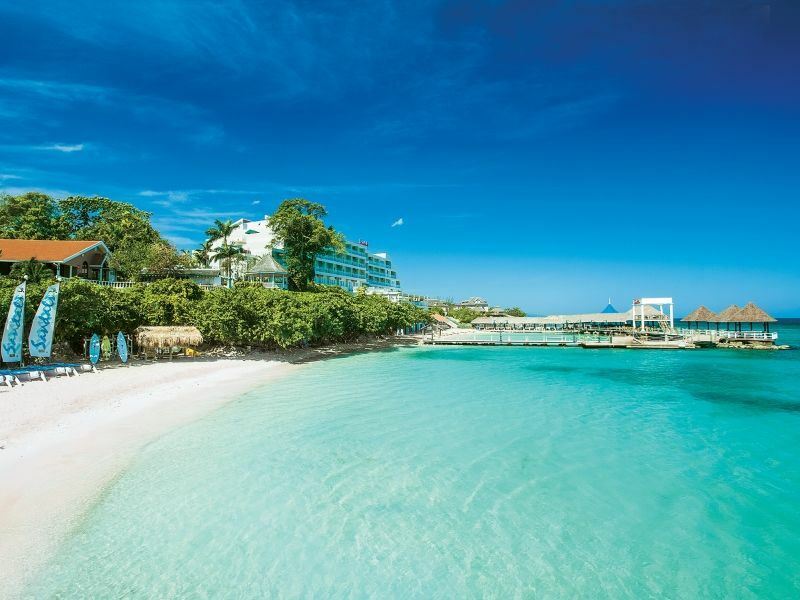 Sandals have seven resorts in Jamaica just waiting to be discovered. 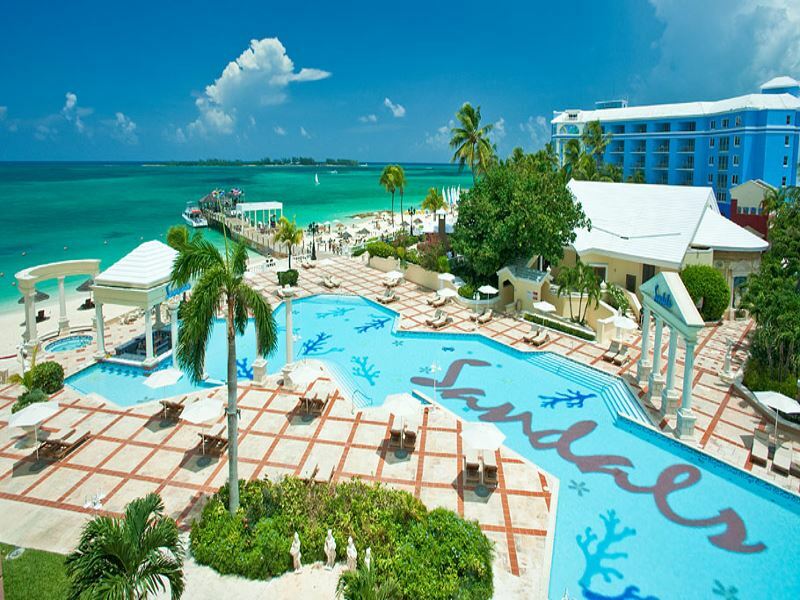 Sandals Royal Caribbean Resort & Private Island is a luxurious Caribbean escape like no other. Visit the resort's own private offshore island for a tranquil day on the beach or for an evening meal at the Thai restaurant found beachside on the island. Choose rooms located right on the sand, with views of tropical gardens or poolside with a private whirlpool. For the holiday of a lifetime go all out with an Over-the-Water Villa. 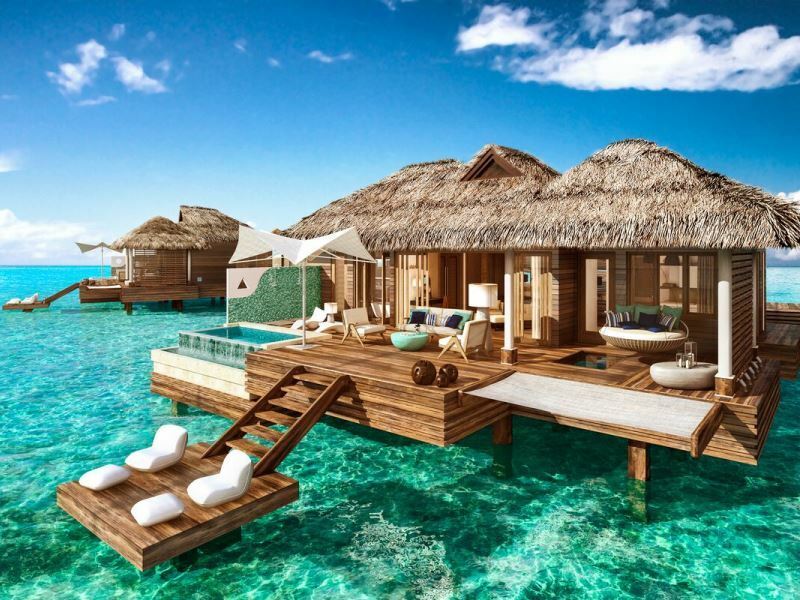 The dreamy beach bungalows on stilts come complete with glass floors and private sundeck floating over the azure blue Caribbean waters. Relax in your private infinity pool or Jacuzzi and let your own personal butler tend to your every need - this is the ultimate Caribbean retreat. 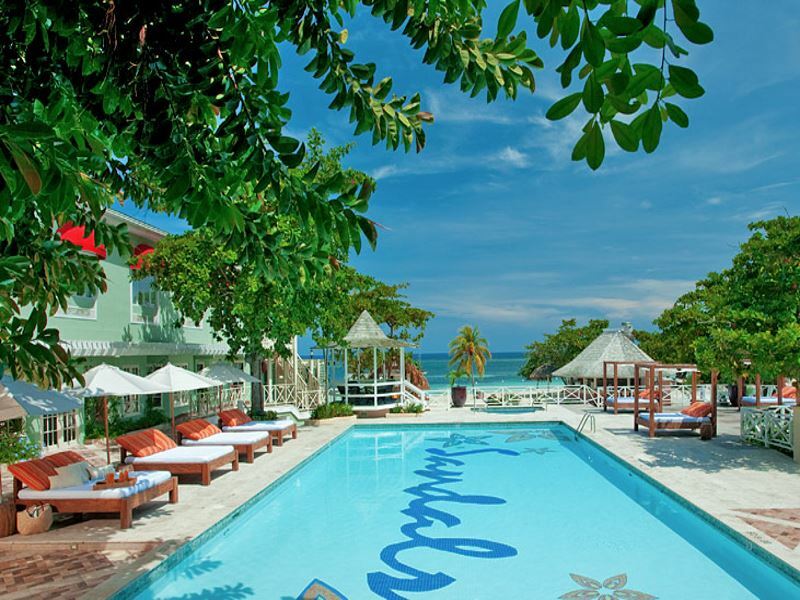 The smallest resort in the Sandals collection, Sandals Inn is an intimate boutique resort with just 52 rooms; perfect for a romantic retreat for two. Situated in the heart of Montego Bay, step outside the resort on to the beach and take a short stroll to the Hip Strip full of bars, restaurants and shops. Lavish rooms come with 24-hour room service and the Ocean View Penthouse comes with a personal butler. There are three restaurants to indulge in but if you want to dine out there is the option to use the facilities and eat at two other nearby Sandals resorts - with transfers included its an added bonus to a blissful holiday. 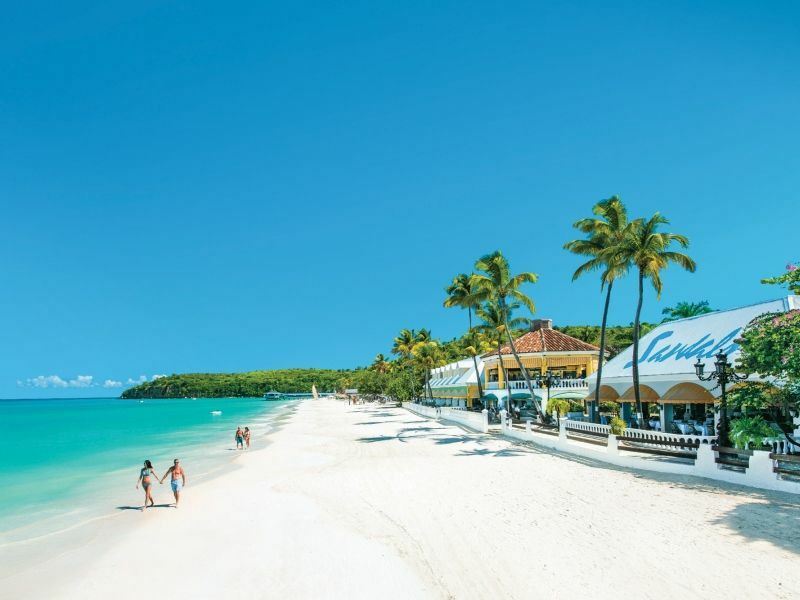 The original Sandals Resort is set on a stunning stretch of beach - if you dream of white sand and sparkling ocean then you will find it here. 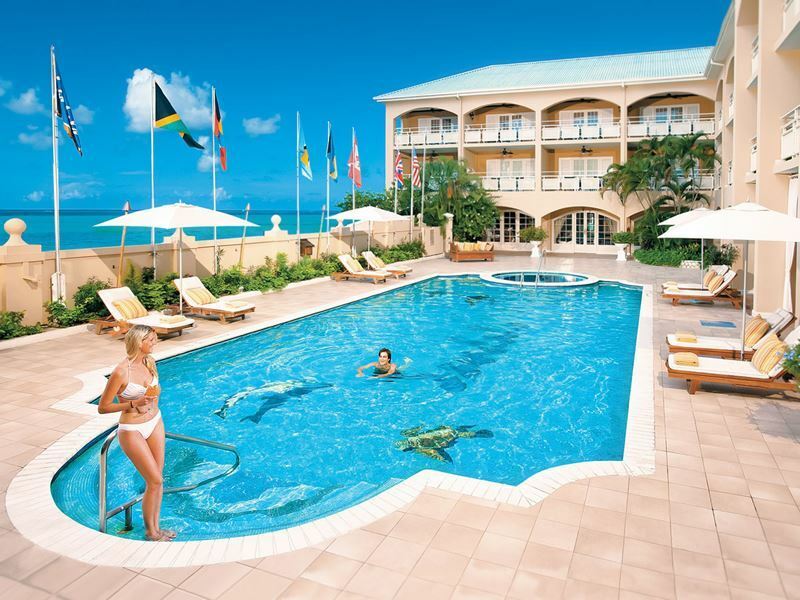 The main swimming pool overlooks the sea and with three others to choose from you will be in Caribbean heaven. Water sports are a wonderful way to spend the day in paradise; calm waters protected by coral reefs are fantastic for snorkelling and diving. Head out to sea on a kayak or Hobie Cat for a real tropical adventure. Nine restaurants are a foodies’ dream, from a coffee and pastry in the Parisian café to laid back beachfront dining with authentic Jamaican food and lunchtime cocktails. 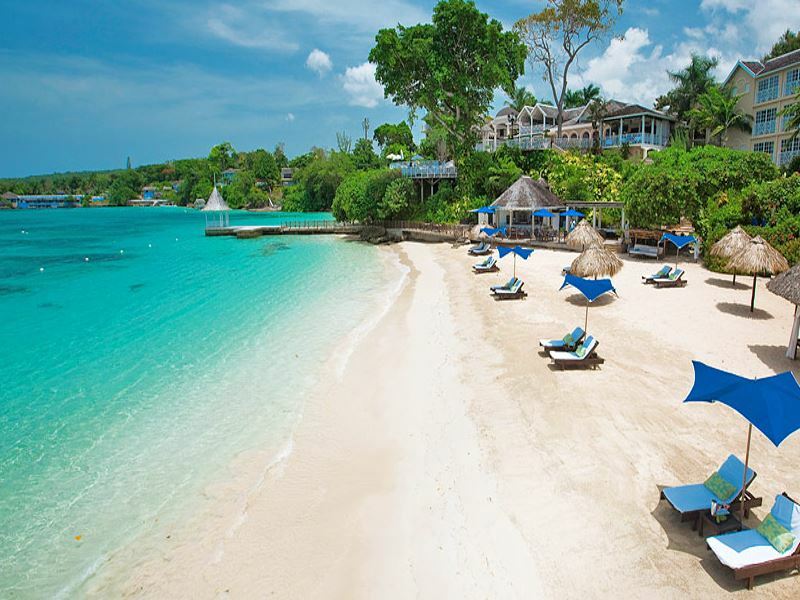 It’s laid back beach vibes all the way at Sandals Negril Beach Resort & Spa. The resort's setting on a seven mile stretch of shoreline is simply paradise, offering the perfect shady palm to grab a book and chill out right on one of Negril’s most beautiful beaches.Chic and sophisticated rooms have breath taking views of the ocean and tropical gardens - relax on the balcony in a soaking tub for two or choose a room with direct pool access and beach views for truly luxurious holiday vibes. Almost all of the seven restaurants can be found on the beach, so you can enjoy the sunset in style. Nightly themed entertainment including a beach party, Jamaica Day and Island Night mean you can really get into the chilled out Caribbean lifestyle. Sandals Ochi Beach Resort offers the perfect mix of rest and relaxation plus a whole host of active pursuits if that’s what you are looking for. 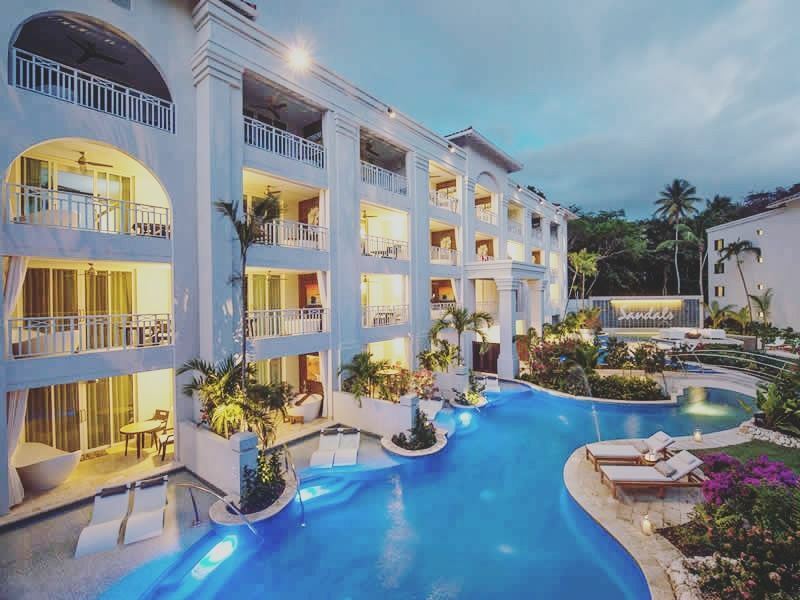 From a Caribbean party scene at Ochi Beach Club to a private cabana hideaway for two right on the beach, this resort caters for all sides of your holiday. Indulge and unwind with an outdoor massage by the ocean or for the adventurous traveller there is fantastic rock climbing. Choose a room or suite either along the Caribbean Riviera with its elegant rooftop lounge overlooking the sea, perfect for sunset cocktails; or at the Butler Village and Great House where a private villa with a pool and Butler Service await. This intimate resort has an elegant colonial feel with a beautiful Caribbean backdrop. All 74 suites have ocean views and all come with Butler Service as standard; this is the only Sandals resort in Jamaica to offer this level of service to all rooms. Let your butler who is trained to the highest standards by the Guild of Professional Butlers take care of all your holiday needs, from booking trips and spa treatments to serving lunch while you relax on the beach. Whatever you need they will strive to make you happy. Room bars are stocked daily with wines, spirits and more and are all included in your stay. A private beach, fine dining at five restaurants and the exclusive C Bar serving caviar and champagne make this resort a super stylish retreat. Set within a nature preserve and on a heavenly beach, the emphasis of this resort is very much focused on the sparkling turquoise ocean; featuring Over-the-Water Bungalows, a bar set over the water and an Over-the-Water Chapel for those wanting to get married in paradise. 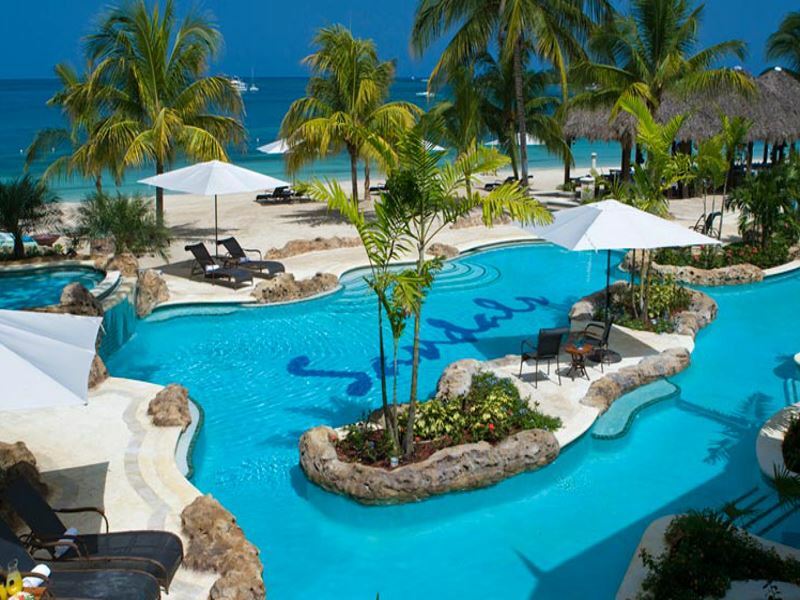 Sandals South Coast has it all; choose from three European style villages, four pools, two swim-up pool bars, unlimited land and water sports plus unlimited scuba diving. For a special evening meal visit Sushi on the Sand and enjoy a cosy nightcap by a fire pit under the stars. St Lucia may only be 27 miles long and 14 miles wide but it certainly has it all with a fantastic balance of relaxation and exciting experiences to be discovered. Golden sandy beaches and sparkling waters just right for admiring and catching some rays await. For the more adventurous, zip line through the rainforest, take in St Lucia’s incredible scenery on a helicopter tour, visit a drive in volcano and witness bubbling sulphur springs. Other island must do’s are a trip to a cocoa plantation, a dolphin watching trip and a sunset boat cruise. For stunning scenery capture the majestic Pitons on camera, the twin peaks are a famous St Lucian landmark. 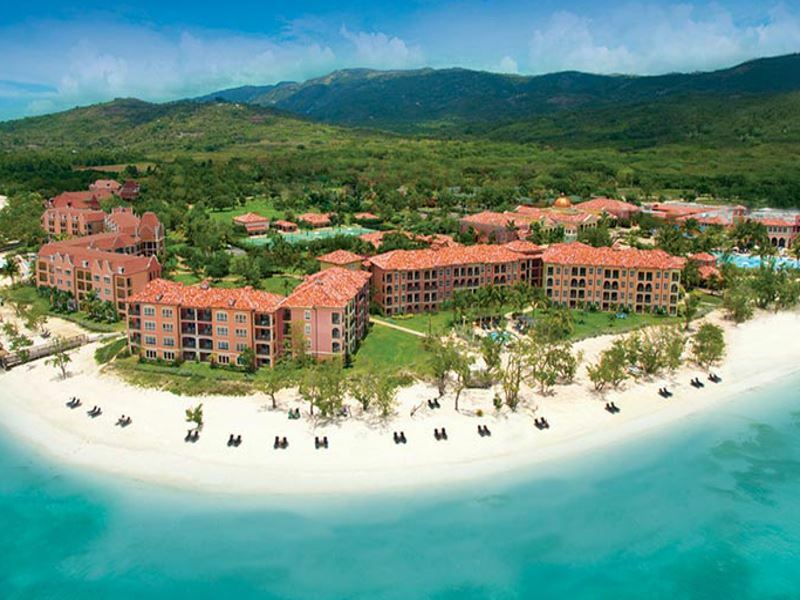 It’s all about the beach at this Sandals resort, nestled along a palm-lined shoreline with a lush tropical backdrop. Soak up the idyllic location in beachfront suites with large terraces and private plunge pools or a Tranquillity Soaking Tub for two. Relax on the white sand and listen to the soothing sounds of the waves lapping on the shore. Enjoy a cocktail at one of two swim up bars and unwind with a couples massage at the Red Lane® Spa. There are six restaurants at Halcyon Beach, for a unique experience try Kimonos, watch as a Teppanyaki chef cooks up a storm at your table, making it a very memorable evening. For seafood Kelly’s Dockside on a pier over the water is a romantic way to end a perfect day in paradise. Sandals Regency La Toc can be found on a secluded crescent shaped bay, full of tropical charm it won’t be hard to escape it all and find your own little piece of paradise here. Ultra-modern rooms cater for all your desires, suites with an outdoor soaking tub for two and villas with private pools set atop a sunset bluff finished off with incredible views of the sparkling ocean are just some of the options available. For that extra special touch of luxury choose a villa or suite with Butler Service. A nine-hole golf course set amongst the 210 acres of tropical estate has some challenging holes with stunning views, be sure to have a camera ready at the 4th tee. Complimentary green fees mean you can play all day. Finish off the day with a romantic candlelit dinner on the beach with your loved one. 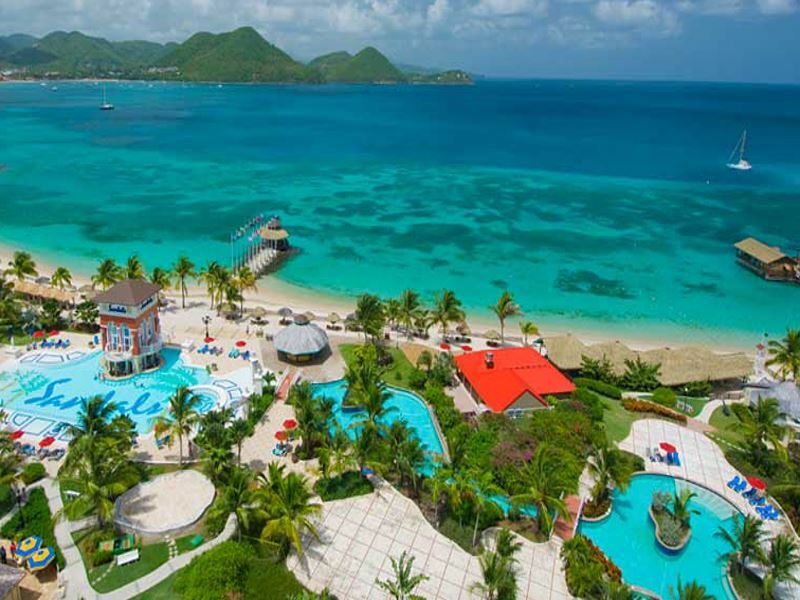 For some much needed beach time Sandals Grande St Lucian is ideally situated on a stunning stretch of sand. The calm warm waters of Rodney Bay are fantastic for paddle boarding, snorkelling, scuba diving and sailing. Next to Pigeon Point National Park this idyllic place has views that only dreams are made of, turquoise waters, white sands and palm trees all backed by lush green hillsides. Over-the-Water Bungalows and beachfront Rondovals with a private plunge pool and Butler Service will complete your blissful Caribbean break. Restaurants from barefoot dining right on the beach to a la carte menus and a crêperie for those moments when a sweet treat is needed are just a few of the 12 eateries to choose from here.